Bang yer ‘ed on the wall ? – that may be your initial reaction. 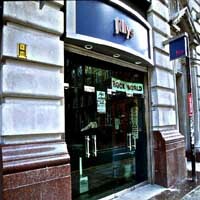 – the proprietor of this venue has been on the music / club seen for longer than it is possible to state. If you trawled through all the acts that have been through this building, we think you would be surprised. Obviously with some focus on rock, sibling (and now well established) venue the Music Box has taken over some business from the now defunct Boardwalk (sadly missed). Massive club nights are now well in swing as is the largest and most dynamic club p.a. in the City (if not the North of England ?). Also expect to see a mix of touring and local bands appearing at the City Centre end of Oxford Road.